Field Sparrow carrying an insect to its young. Photo by Ken Mattison. Watching birds eat from your bird feeder can be a true joy, but did you know that you can take your bird feeding and bird watching to the next level by growing native plants? Native plants will attract birds and support them by providing them the natural foods they need to thrive such as seeds, nuts, fruits, berries, nectar, and insects. Forming the base of the food web, native plants attract beneficial insects and their larvae (e.g. caterpillars), which is a critical food source for most terrestrial bird species. According to Doug Tallamy, author of Bringing Nature Home and an entomologist at University of Delaware, 96% of North America’s terrestrial bird species feed their young insects, insect larvae, and spiders. Habitat that is rich in native plants is essential for supporting these insects and the birds that consume them. Non-native plants fall far short by comparison. For example, Tallamy’s work has found that native Flowering Dogwood supports 117 species of butterflies and moths, compared to the non-native Kousa Dogwood (from China), which supports zero. 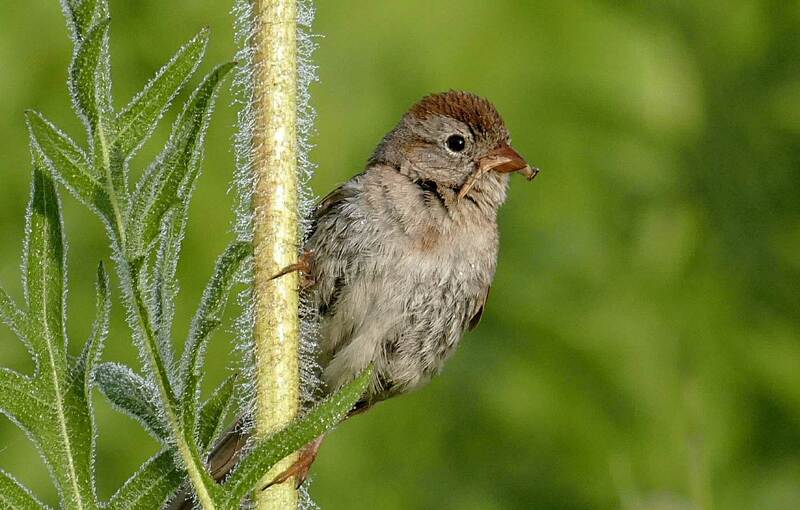 Beyond food, native plants also provide birds with protective cover and nesting sites. Landscapes full of native plants can be vital sanctuaries for birds to rest and refuel when migrating. Pollinator Habitat Demonstration Garden at Pleasant Grove Park, Fluvanna County, established by the Virginia Department of Game and Inland Fisheries Habitat Partners© Program, in cooperation with Powhatan-Goochland Master Gardeners. This native plant garden received a Virginia Association of Counties Achievement Award in 2015. During this Year of the Bird, which encourages people to make simple, yet meaningful actions to help birds, adding native plants to your home landscape is one of the best ways that you can make a difference for birds. As urban development and agricultural areas sprawl further into natural environments, these land use changes remove food and shelter resources that birds and other wildlife depend upon. One way to address this loss of habitat is to contribute habitat patches wherever we can by minimizing the size of our mowed lawns and increase the amount of our landscaping with native plants. Collectively, this simple action is extremely beneficial. You can start little by little and eventually turn your home landscape into a sanctuary for the birds and you! You may even find that your handiwork inspires your neighbors to follow suit, thus maximizing your impact. Ready to Get Started with Native Plants? DGIF Can Help. Native plants can be planted on a smaller scale or restored to a larger-scale landscape. Regardless of the plot size, anything from a home garden to a farm field can support pollinators and other beneficial insects and these will in turn attract and support the birds. DGIF offers loads of resources to get you started and inspired in the habitat section of our website as well as through a couple different programs. The DGIF Habitat Partners© Education Program provides volunteer training for community leaders who want to establish native plant demonstration gardens for wildlife viewing and public education outreach. Volunteers such as Master Gardeners, Master Naturalists, Native Plant Society members and other community groups, as well as landscape professionals who are interested in conservation landscaping practices, can contact Carol Heiser, DGIF’s Habitat Education Coordinator, at Carol.Heiser@dgif.virginia.gov to inquire about program availability. This meadow of native grasses and flowers was part of a multi-faceted, larger scale project to convert what once was a working cattle farm to native habitat. Partners involved included: DGIF, Virginia Department of Forestry, NRCS and the Smithsonian Conservation Biology Institutes’ Virginia Working Landscapes team. The landowners, the Tidball family, received the Culpeper Soil and Water Conservation District’s Wildlife Conservation Award in 2017. For private landowners, DGIF has a team of five private lands wildlife biologists (PLWBs), hired jointly with Virginia’s Natural Resources Conservation Service (NRCS), that specialize in on-site landowner habitat evaluations followed by detailed management planning where appropriate. Working with native plant species is a cornerstone of their technical expertise. They are also experts on multiple habitat incentive programs available through state and federal agencies. Interested landowners can find out if their area is suitable by contacting their local PLWB or Marc Puckett, DGIF’s Small Game Project Leader, at 434-392-8328, marc.puckett@dgif.virginia.gov. The plants you grow at home matter. Landscape and garden with a diversity of native plants and the birds will follow. They’ll be well fed and sheltered and you’ll enjoy improved birdwatching for years to come. Pollinator planting Amelia Wildlife Management Area. Photo by Marc Puckett. Plant Virginia Natives – Download a regional native plant guide and find out about the Virginia Native Plant Action Plan. Chesapeake Bay Native Plant Center – Search the user-friendly database for native plant options for your region and conditions. Audubon Native Plant Finder – Enter your zip code and find the best native plants for birds in your area. Managing Land in the Piedmont of Virginia for the Benefit of Birds & Other Wildlife – Find land management recommendations that benefit birds in this introductory how-to guide.